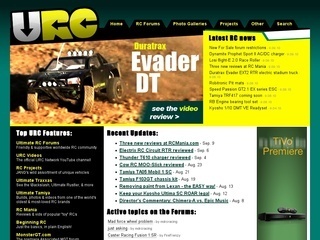 If you have been around this hobby for any length of time and have turned to the internet for guidance or research, then you probably stumbled onto Ultimate RC and eventually bookmarked the site. The site has been offline since November 19th and Jang(The owner) has been working very hard to get it back up and running. Has been keeping users informed as he makes progress and now he is reaching out to the RC community for a little help. He would like us to simply click around a few partial (partially broken) pages on the site. If you are interested in helping, get the complete story and details at Ultimate RC.